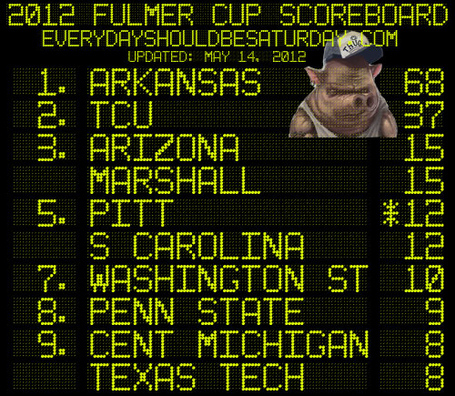 Man, I thought Auburn’s mark in last year’s Fulmer Cup would withstand the test of time, but Arkansas is sure giving that a run for the money. There’s still three and a half months to go before the season starts. Kinda puts Georgia’s measly 2010 winning total in perspective, doesn’t it? Bailey played at least 100 plays for Georgia in seven game during his junior season in 1998 and put up better numbers than 1997 Heisman-winner Charles Woodson in doing so. I’m not saying Champ should have won the Heisman that year – Ricky Williams rushed for more than 2,300 yards, remember – but I have a hard time understanding how these numbers didn’t translate into better than a seventh place finish with the Heisman voters. If they don’t care, should we? I’m not going to delve into the reasons why we’re so passionate about college football, but it’s clear that we are. I blog about it; you read and comment about it. We fill stadiums up, not just during the regular season, but for meaningless spring games as well. And contrary to any romantic notions we may hold, you can put a dollar sign on that passion. As incredible as this may sound given athletics departments’ addiction to TV money, college sports has actually been undervalued. That’s changing due to viewer interest and more competition among media companies. This week, Broadcasting & Cable Magazine reported that CBS’ ad prices for the SEC are up 10 percent from last year. We’re the ones who motivate the networks and the conferences to haggle over the fees. I’ve said before, college football isn’t a monolithic institution, like pro sports leagues are. It’s more a loose confederation of haves and have-nots. That’s been reflected in the TV deals the mid-majors have, the battle over postseason revenues and, of course, the musical chairs game of conference realignment. What we may be seeing now, with the FSU story, is the start of a serious battle of the haves. And as fans, what we should be concerned about is whether the compromises made in the chase for the dollar turn what we love into something that’s not as attractive. The suits pay lip service to us and our passion, but it’s clear that commitment doesn’t mean what it used to mean. Florida State’s athletic program has experienced unprecedented success lately finishing in the top 10 of the Directors’ Cup for the last two years. Even the major revenue generating sports – football, men’s basketball and baseball – have done well. While falling just short of a BCS bowl appearance, the football team has won nine-plus games the last two years, won the state championship and played in two relatively high profile bowl games that both sold out. And within this same two-year span, baseball hosted two NCAA Super Regionals and has been to one College World Series. And Leonard Hamilton’s basketball team followed a Sweet 16 appearance in 2011 with an ACC Championship in 2012. … while gliding by the unhappy reality that you’re the reason your school is shopping itself to the highest bidder. … Sagging football attendance is the main reason for Florida State’s budget shortfall. For a program accustomed to competing for national titles, going 26-14 over the past three seasons apparently isn’t cutting it for many fans. Donations are way off, too. Four years ago, Seminole Boosters reported total revenue of $42.8-million, according to its tax records. In its most recently reported year, it brought in $32.7-million. And those aren’t the athletic department’s only financial problems. In February, Moody’s Investor Services downgraded the revenue-bond rating of FSU Financial Assistance, a unit of Seminole Boosters, after it had to come up with extra money to prop up the athletics program. The irony here is that FSU, should it make the move, comes off as glorified cupcake. It gets more money with a switch to the Big 12, but it will face tougher opposition. Going 26-14 against the likes of Wake Forest and Clemson (two schools it’s struggled with) translates into what against Oklahoma, Texas, Oklahoma State, etc.? If the wins don’t flow more readily in the new home, when does a drop in fan enthusiasm, which will pick up with the shiny new conference change, rear its ugly head again? I don’t mean to pick just on FSU here. It’s very much the same story as we watch the SEC muddle through its scheduling issues resulting from expansion to 14 schools this season. And it’s driving the postseason reset, too. The thing I keep asking myself as I watch the money chasing not just continue unabated, but actually accelerate, what makes all these folks smart enough to know when to stop? Assuming that there’s a need to stop, as our need for sports is, if not insatiable, pretty damned close to that. Tell me this doesn’t resonate with you to some extent. I find this funny, because I think we’re in the middle of a college football bubble. Look at the past couple of years. We’ve seen a huge upheaval in conference alignments, as folks jettison history in a desire to get the cash a conference football championship brings. And it’s paid off in the short term, as networks have thrown down large chunks of change in advance of a possible NFL lockout. But more schools and bowls are losing money on the postseason. Last fall saw investigation of agent contact at Alabama, Florida, Georgia, South Carolina and of course, North Carolina, and since then Ohio State’s football program has completely melted down and Oregon is fending off charges of paying for recruits. I’m guessing this aspect is going to get much worse before it gets better. Bowls are throwing around bribe money, and Congress is showing signs of investigating. And finally looming on the horizon is the increased findings on concussions, which is beginning to draw some heat in the NFL, and is just one coach’s bad decision away from blowing up in the face of a college football program. Now that was written about a year ago, and it doesn’t look like we’ve hit any sort of peak yet. But something he posted a couple of months later sure looks prescient. The other sure sign of a bubble? In the midst of everyone clamoring to throw money at the tradition and pageantry of college football, the people providing it start saying how meaningless said tradition is. Bob Stoops announces that the 105-game Red River Rivalry can be dropped, if need be. It’s not important. The 86-game Nebraska-OU rivalry has already gone the the way of the dodo after all, and Texas is saying they’ll drop A&M from their schedule. Because I’m sure a thrilling yearly battle with Navy will bring just as many eyeballs. History no longer applies, and the quality of the product we’re selling isn’t important. Both things that are said right before the market for whatever you’re hyping crashes to earth. Anyway, everything looks one step closer to the consolidation into 16-team conferences, after which they really stop being conferences and just become television cartels. I’m sure fans of teams divorced from everything they’ve known will continue to love their new travels to far-off venues for mediocre games. After all, there will be a new uniform combination debuted! That’s what everyone’s watching for, right? Sigh. I’m not sure what’s more depressing, to be played for suckers by the suits, or to have the suits proven right by that. It remains to be seen whether that happens, but my other sad reflection here is what happens if the suits overshoot the mark and do damage our affection for the sport. Getting the genie back in the bottle is always a tough task. It’s even tougher when it’s the people who screwed things up who are expected to be the ones to fix the mess they created in the first place. Color me deeply pessimistic. Even though he’s backtracked a bit from his initial pique, FSU’s Andy Haggard has pretty much ensured that the Seminoles’ future in the ACC will be the topic du jour for at least the next few days. … We’re getting ahead ourselves (sic). For now, ESPN would almost certainly discourage Florida State from leaving. FSU to the Big 12 would devalue that just-signed ESPN extension. Meanwhile, with expansion, the Big 12 would be soon asking for more money. Sure, the money might cancel out but wouldn’t ESPN be sick and tired of reopened multi-billion dollar deals? Don’t forget the network is currently in negotiations with the SEC trying to figure out what the addition of Texas A&M and Missouri are worth. That’s an interesting dilemma for the WWL, isn’t it? The thing is, Dodd doesn’t even touch on the other irony here. If FSU is whining about financial disparity as a member of the ACC, wait ’til it gets to the Big 12, home of the ESPN-partnered Longhorn Network. The ‘Noles ain’t seen nothing yet. One thing’s for sure in all this: ESPN isn’t in it for its health. Or FSU’s. Or the ACC’s. Or the Big 12’s.